A few months ago I had the opportunity to bring my daughter to work as part of her school’s Take Your Child to Work Day. My seven year old, Charlotte, really enjoyed the opportunity to see what her father does for a living and watch AAA-1 Masonry’s licensed masons in action. Scaffolding was erected, mortar mixers turned and turned, men shouted out orders for more bricks and mortar, and Charlotte had the chance to see exemplary masonry restoration work in real time. We drove to Bucktown, Wicker Park, Hyde Park and the North Shore during our day together. It was a memorable experience for both of us, and she slept very well that night! This past weekend, I had the opportunity to bring my five-year-old son, Harrison, to work during the morning hours. (We work every day the weather allows Monday - Saturday.) Wow, did he have fun! Prior to the men starting the construction of a new section of wall in Edison Park, Harrison was allowed to hold a few bricks and pretend he, too, was a mason. We talked about the different size bricks we use (Standards, Modulars, Romans, etc. ), the different types of mortars we use depending on the application, and the importance of maintaining a safe and clean job site. The best part of the day, though, came at bath time when Harrison shared with me that he wants to do exactly what I do when he gets older. Those were the nicest words this Daddy mason could hear! 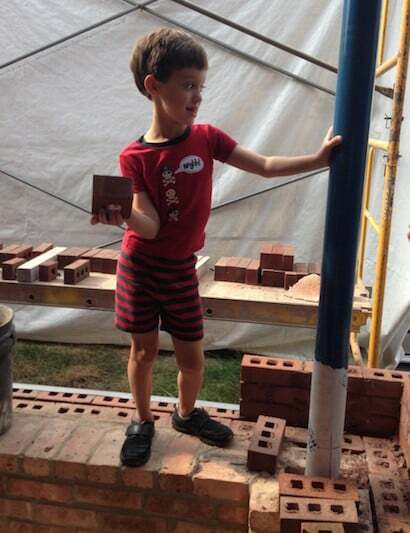 Might there be a third-generation mason at our little masonry restoration company in the not-so-distant future?!? Thank you to all of our loyal clients for your continued patronage and numerous compliments!